The Eiffel Tower is one of the most recognisable and most visited landmarks in the world. Located in Paris, France and originally intended to stand for only 20 years, the Eiffel Tower has instead dominated the Paris skyline for almost 130 years now. Here are ten facts about the famous structure. The Eiffel Tower is named after the French architect Gustave Eiffel, whose company, the Compagnie des Établissements Eiffel, designed and constructed the tower. However, Eiffel himself didn't actually design the tower. Engineers Maurice Koechln, Émile Nougier, and architect Stephen Sauvestre, were the men who designed it. Eiffel bought the patent for the design from them. The Eiffel Tower was constructed as a centrepiece for the World Fair of 1889 which was to be held in Paris to celebrate 100 years since the Storming of the Bastille and the beginnings of the French Revolution. Its function has always been for it to be an attraction, intended to demonstrate modern French engineering. A competition was held for somebody to come up with a design for something spectacular for the fair, but rather suspiciously, after having seen plans for the Eiffel Tower, the rules for the competition were amended to state that the centrepiece needed to be a four sided metal tower, 300 metres high. Construction of the Eiffel Tower began on 28th January 1887 and took two years, two weeks and five days to complete, ready for its inauguration on 31st March 1889. On this day, Gustave Eiffel took a group of important people for a trip up his tower. They had to walk up the stairs though as the lifts weren't working by then. Sacre Bleu! 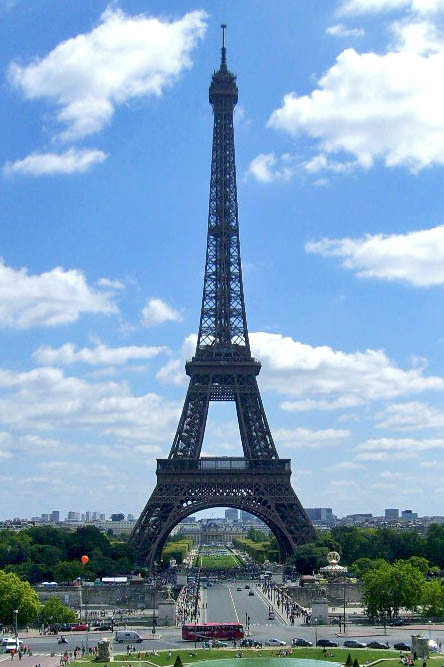 One of the requirements of The Eiffel Tower was that it should be easy to dismantle. This is because it was intended that it would be taken apart after twenty years when the land on which it stood would be given back to the City of Paris. It should have been demolished in 1909, but another use was found for it which meant it could remain standing. Radio was a fairly new invention at the time, and the Eiffel Tower made an ideal place to stick a radio transmitter. This proved pretty handy in 1914 when the Eiffel Tower's transmitter received and jammed German radio communications in the First World War. Nowadays there are all kinds of radio and TV transmitters on top of it, taking its height up to 324 metres. 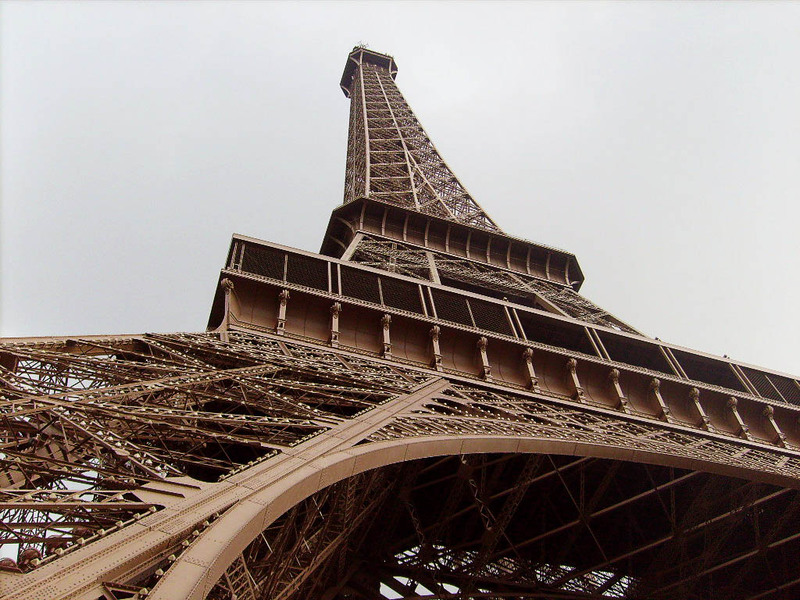 The Eiffel Tower is painted in three shades of brown, with the darkest shade being at the bottom and the lightest at the top. It hasn't always been brown though. Originally it was a reddish-brown colour. It has also been orange and yellow. The Eiffel Tower is repainted every seven years to protect it from rusting. When it was built, the Eiffel Tower was the world's tallest structure, standing at 300 metres. It held this record until 1930, when New York's Chrysler Building, 319 metres high, took the title. The Chrysler Building didn't hold onto this honour for very long though as 11 months later, the taller Empire State Building sprouted up in New York at a height of 381 metres. Taking and sharing photographs of the Eiffel Tower is fine, unless they have been taken at night. This is because the light shows that illuminate the tower are classed as art and are copyrighted by whoever created them. The Société d’Exploitation de la Tour Eiffel are the people you need to go to for permission. Thinking that the Eiffel Tower was going to be a useless monstrosity, Parisian artists protested against its construction. They believed that it would overshadow buildings like Notre-Dame, The Louvre and the Act de Triomphe. How wrong they were. In the Second World War, as the Allied Forces began to advance on Nazi-occupied Paris in 1944, Adolf Hitler ordered that the Eiffel Tower should be destroyed as well as much of the rest of Paris. The order was disobeyed.